The Stallion Responsive WordPress SEO Theme is the best All In One SEO package for WP blogs and WP powered websites. 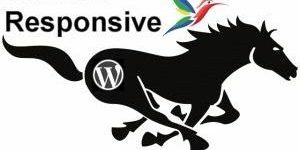 Stallion is much more than a WordPress theme, the WP SEO package protects your hard earned off-site SEO using advanced on-site SEO techniques like no other WordPress SEO solution. There are two elements to search engine optimization, on-page or on-site SEO and off-site SEO or off-page SEO. On-page or on-site search engine optimization: What we do on our websites, we have full control over this aspect of search engine optimization and Stallion includes dozens of SEO features to increase search engine traffic. Off-site or off-page SEO search engine optimization: Any off-site promotion that has an SEO benefit like building backlinks, social network activity, press releases, syndicating content, guest posts etc… we have a lot less control over off-site SEO. 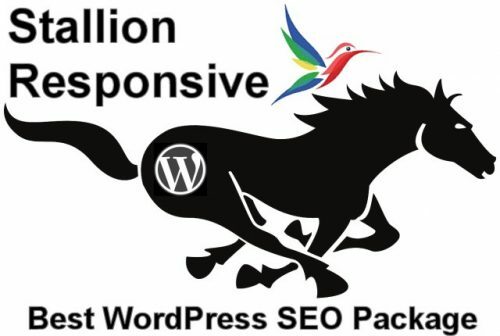 Stallion protects your hard fought off-site SEO benefit as it flows through your WordPress powered website. The Stallion SEO theme removes the vast majority of core WordPress on-site SEO and on-page SEO damaging issues protecting your hard earned off-site SEO you’ve worked so hard to build. Yes, WordPress out the box causes SEO damage, in particular adds a lot of link benefit deleting rel nofollow links which only Stallion Responsive fixes. ALL popular WordPress themes and WordPress SEO plugins including Yoast WordPress SEO and All In One WP SEO Pack plugins make matters worse by adding even more rel nofollow links (and noindex features)! Yes, the self proclaimed best WordPress SEO plugins damage your on-site SEO which wastes your valuable off-site SEO promotion! Protect your off-page SEO with the Stallion SEO theme. This is not a marketing ploy to sell Stallion Responsive, as of April 2015 there are no other WordPress themes, plugins (any WordPress package) that removes ALL rel nofollow links from a WordPress powered site. By attacking Yoast and All In One for using nofollow I’m going against the current WordPress consensus (the majority of WordPress users think these SEO plugins are awesome, millions of users). By going against the WP SEO consensus I loose potential SEO theme buyers. I’ve integrated the most important Yoast SEO and All In One SEO data into Stallion Responsive: Stallion works with Yoast and/or All In One SEO data, in fact Stallion’s SEO data uses the same database names as the All In One SEO plugin SEO data so Stallion SEO data works with the All In One SEO plugin and it’s SEO data works with Stallion. With a few clicks of the mouse Stallion will use Yoast’s SEO data and Yoast can use Stallion’s SEO data. I’d make more theme sales if I ignored the SEO plugins damaging nofollow SEO features and promoted Stallion Responsive as the theme to use with Yoast and All In One SEO to fully use the Yoast and All In One SEO data: Stallion is the ONLY theme to use this SEO data for anything beyond the title tags. For example the H1 header of this article (the H1 is “WordPress SEO Theme”) is using the All In One SEO Title Tag SEO Data (could use the Yoast SEO data format with a few clicks of the mouse), as are some of the internal links anchor text to this article. Go to the home page and look at the link back here from the Popular Posts widget, it’s anchor text is also “WordPress SEO Theme” which is the All In One SEO Title Tag data. Try to find another WordPress theme which uses Yoast and/or All In One SEO title tags this way (Stallion can use them both at the same time). Had I not attacked the SEO plugins maybe by now they’d recommend Stallion Responsive as the go to theme for taking full advantage of their SEO title tags data. I’m too ethical to work this way, the only SEO solution to the damaging WP nofollow issue is Stallion. There are 12 built-in Stallion Responsive layouts, each one just a couple of clicks of the mouse away, all the Stallion layouts are search engine optimized (main content is high in the HTML code) and are all mobile responsive. This website uses the Left 310px Layout (3 – Main Content 660px : Left Sidebar 310px). On every WordPress post and page edit screen you can select one of the 12 layouts just for that post/page (yes, every post can have a different layout). Click the image below to see a screenshot of the 6 two column Stallion Theme Layouts above. Each Stallion Layout can also be used on a post by post basis. Click the image below to see a screenshot of the 6 three column Stallion Theme Layouts above. There’s also a two column version that splits the archive page layout into two columns and the ability to order posts by date, comment count, modified date, alphabetical and by post ID. Choose from 26 built-in font schemes. Each Stallion Font Scheme can also be used on a post by post basis. 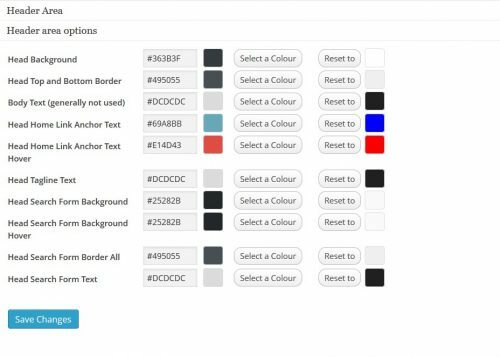 Choose from 112 built-in colour schemes. Each Stallion Colour Scheme can also be used on a post by post basis. With 12 layouts, 26 font schemes and 112 colour schemes there are 34,944 (12 x 26 x 112) possible combinations of layout/font/colour scheme. If you own a site with 34,944 posts each one could have a different combination: yes, every WordPress post on your site can have a different layout, font and colour schemes. Stallion Responsive also includes built-in WordPress colour scheme and font scheme creators which with no CSS knowledge (CSS is how WordPress colour/font schemes are created) anyone can modify any of the built in colour schemes or create their own unique look. Stallion includes 5 ad networks and custom ads. For AdSense, Chitika, Kontera, Infolinks the ad code is built into Stallion, all you have to do is add your AdSense publisher ID or username to the easy to use Stallion options page and your site is monetized. Here’s a list of some of the WordPress SEO features in no particular order. 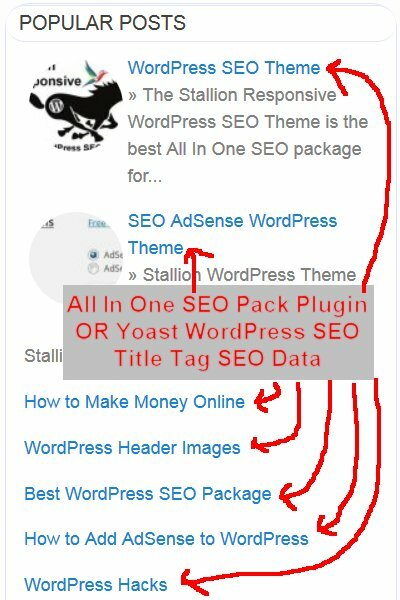 This is a taste of the built-in All In One SEO WordPress features of the Stallion theme, there’s even more going on behind the scenes you’ll not even notice, but it works for your WordPress sites search engine rankings. There’s an options page devoted to promotion based features. Social Network Profile Links – See them floating on the right of this page. Author Biography Box – See in action at the bottom of this page. Each purchase entitles the user to use Stallion V8. * on as many of their own domains as they like. There’s no developer license. If I find a customer selling sites with the same Stallion V8. * ID that Stallion ID will be disabled. If you own 10,000 sites you need one Stallion V8. * ID for your entire private network. If you sell sites running Stallion each site needs its own ID. Basically one Stallion ID per user. By purchasing a Stallion Responsive 8. * ID you are entitled to free V8. * updates and support (all support via comments on this website) for as long as I develop Stallion Responsive. This website is not only for selling the Stallion WordPress SEO theme, it’s also the support site via the comments. No matter what you think of the Stallion theme or the support offered as long as a comment is constructive (not abusive) it won’t be deleted, I think a quality service is measured not when everything is working as expected, but how issues are dealt with when it all goes pear-shaped. With the current trend to have full screen width websites is there any way to do that with Stallion? I’m just about to build out a directory site along these lines http://www.glasscompanynearme.com/ and wondered if I could recreate something like that using the power of Stallion SEO theme. Looking at the theme layout options it seems that 760 is the largest content width. I’ve had Stallion for years but haven’t been active for some time (stupidly ceased all my sites a couple of years ago) and am only just getting back into using Adsense sites for potential Rank and Rent. Just feel that the expectation from visitors these days are full width sites. The quick answer is no, the max width is the 1,000px wide no sidebars layout set under the “Layout Options” : “Sidebar Layout” – “12 – Main Content : No Sidebars”. With this setting in a Desktop device the main content width is around 1,000px and the left and right widget areas drop below the main content into two widget areas: two side by side footer widget areas. There are several reasons why there isn’t say a 1,300px wide layout or a fluid layout. To have 12 desktop layouts with varying types of left/right sidebars and main content widths whilst using the exact same SEO HTML output (the main content loads high in the code no matter which layout is set) is REALLY difficult to achieve: look up the “Holy Grail Layout”, Stallion Responsive uses a custom SEO version of the holy grail layout (took me weeks to iron out all the CSS layout problems, was a huge achievement getting it to work for 12 layouts). I doubt any other theme can achieve the same as the Stallion Responsive Holy Grail SEO Layout for so many different layout sizes. If you compare the code source (the HTML output in a browser) of a Stallion Responsive left sidebar layout vs a Stallion Responsive right sidebar layout you will find they are identical : achieved using different CSS files only. The above is important SEO wise, main content is high in the code source and less important content is pushed to the bottom (loads last). If you use a random WordPress theme with a left sidebar layout, the vast majority of the time you’ll find the HTML code for the left sidebar loads above the main content. If you use a random WordPress theme with a right sidebar layout, the vast majority of the time you’ll find the HTML code for the right sidebar loads below the main content. If you use a random WordPress theme with a left and right sidebar layout, the vast majority of the time you’ll find the HTML code for the left sidebar loads above the main content and the right sidebar loads below the main content. The Stallion Responsive Holy Grail SEO Layout is as good as it gets SEO wise, doesn’t matter which layout is set the HTML output is always the SEO version and to achieve this requires a fixed width and I had to choose a maximum width due to header/banner image sizes. For non Stallion Responsive theme users you might take always from this is avoid using themes with a left sidebar, they aren’t as SEO friendly. All the Stallion Responsive headers and banner images have a maximum width of 1,000px. This a compromise between having flashy features (big image at the top of a page) and image size (smaller image sizes are better SEO wise). Had we started with a 1,300px wide header image rather than 1,000px wide it would have a negative SEO impact. The trend has moved towards mobile first design (smaller layout widths), not wide layouts per se (Desktop output is becoming secondary) as more users are accessing the web using mobile and tablet devices. It still uses the same SEO HTML output listed earlier, the CSS code outputs all the different layouts without changing the HTML output that Google cares about. Since mobile first design is the new norm I’m planing in the future to start again from scratch (not planned exactly what to do yet and it’s a while away). Currently working on pulling out a LOT of the SEO features from the Stallion Responsive theme to put them in the Stallion WordPress SEO Plugin (which is free) and other plugins. In the next Stallion WordPress SEO Plugin release (working on version 3.1.0) the meta boxes (found on Post Edit screens etc…) for Stallion Responsive SEO titles (and Yoast SEO and All In One SEO titles/meta descriptions etc…) and Stallion Responsive Keyphrases (1-4) are part of the plugin. The current plan is to remove those meta boxes from Stallion Responsive 8.5 (the next theme update) so users can install the Stallion SEO Plugin to access those SEO features. Other theme developers will also be able to create new themes which use the Stallion WordPress SEO Plugin features that are currently only available in Stallion Responsive. The plan is to do the same with other SEO features, for example the Stallion Responsive Layout Option : Display Widgets has been significantly improved and added to a new plugin called Display Widgets SEO Plus (it’s free). The new plugin has a lot more widget logic options, works with the WPML language plugin, BuddyPress/bbPress and WooCommerce (it’s much better than the Stallion Responsive built in version). By breaking Stallion Responsive up into modules (stand alone plugins) will make updates far easier for me. I currently have to do huge theme updates and though Stallion Responsive is awesome SEO wise, the SEO features are all locked into one SEO theme. When it’s all broken up it will be possible to create new themes (or modify current themes) to use Stallion Responsive features (via plugins) without using Stallion Responsive: a fluid width design with a right sidebar layout for example wouldn’t need the full Stallion Responsive Holy Grail SEO layout code as it wouldn’t have a left sidebar version: could then have a wider (fluid) main content area. Full Width Screen - Now I Understand Why Not! Thank you David for, as always, a comprehensive response to my query. With the recent announcement from Google that they are creating separate indexes for mobile searches (https://www.theguardian.com/technology/2016/oct/14/google-desktop-search-out-of-date-mobile) and the %age of searches on mobile overtaking desktop searches it makes perfect sense to optimise for that, so I’ll sacrifice full width for full SEO optimisation. The reason I’m going to try and use Stallion for this project is Adsense and SEO, so I’m certainly not going to jeopardise that. I’m sure I’ll find a way to present the pages as I want them within the 1000 limit. Also look forward to future developments when you get time to separate out and put them into Stallion SEO WordPress plugin, which I use on all my other sites. One final thing. I use Project Supremacy (PS) SEO plugin on my sites (it’s along the lines of Yoast and AIO but incorporates Schema and page content optimisation within their Projects module. Because of the flexibility within PS I’m able to turn off most of the SEO functions and allow Stallion to “do it’s thing” whilst still allowing me to use other key features. Fingers crossed for this when I get there.